I have a 2009 35E on the fresh water tank there's a 1 inch PVC line coming out the top into a one way check valve and a line coming out the bottom of the tank with the drain valve handle where you drain the tank and then they connect together. Can someone tell me which way the check valve go's in the top line? There is a arrow on the valve, does it point to the tank or away from tank? I had surgery last week and the wife and son was going to help me out and drain the fresh water tank next thing I know the drain pipe is in 7 pieces. So instead of coming in and telling me what happen my son starts taking the pipe apart to replace it and forgets which way the arrow went. I believe the arrow should point away (out) of the tank. The top outlet is the overflow and you do not want water backing up into there. 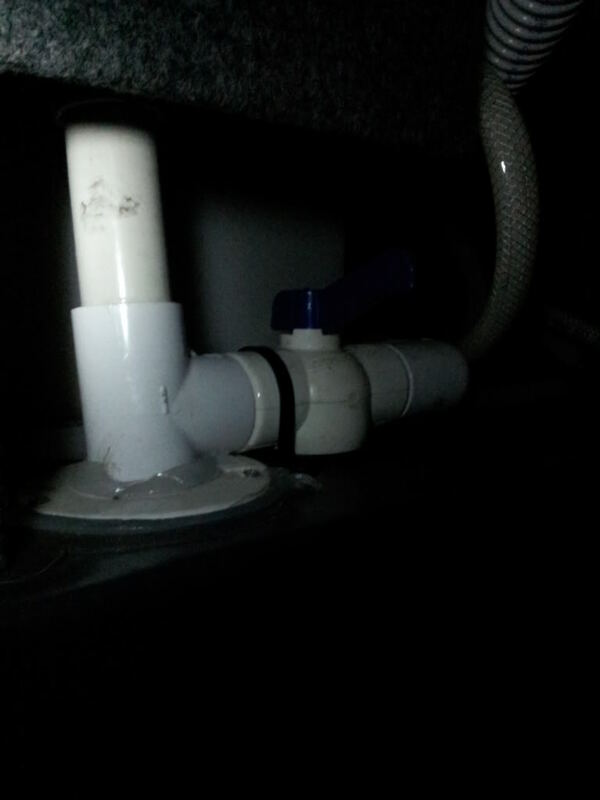 The lower outlet is the drain line and the movable valve closes it off. This is a different set up than mine, plus I'm looking for the one way valve not the drain valve but you you very much.